Often described as "a clown in the cloak of a philosopher," the French Bulldog originated as, and continues to be used as a companion dog. 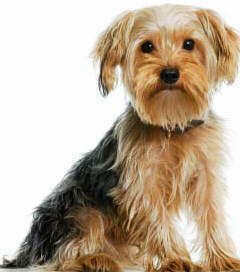 The breed is small and muscular with heavy bone structure, a smooth coat, a short face and trademark "bat" ears. Prized for their affectionate natures and even dispositions, they are generally active and alert, but not unduly boisterous. Lace makers in 19th Century Nottingham, England selectively bred the early bulldog for a downsized or "toy" bulldog, for use as a lap pet. When the Industrial Revolution displaced some lace makers to France, they took the dogs with them, and soon the "toy" bulldogs became popular in France, where wealthy Americans doing the Grand Tour saw and fell in love with them. 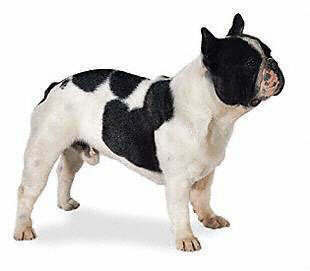 In the late 1800s these "toy bulldogs" became known as French Bulldogs. The breed was registered with the AKC in 1898. This is a sturdy little Bulldog with large, erect, rounded, bat ears, a flat, powerful muzzle and a pug nose. The square flat head is not as massive as the English Bulldog's. The forehead is rounded. Height doesn't matter as long as the dog is well balanced. The height at the withers should be approximately the same as the length from withers to tail set. The dog should be pear-shaped, with the shoulders wider than the tail area. The short, soft, easy-care coat comes in brindle, fawn, white and combinations of brindle or fawn with white. 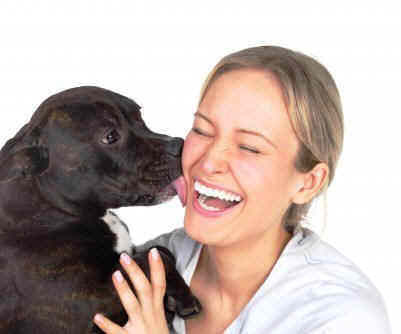 The skin is soft and fairly loose, making the dog very pleasant to pet. The prominent round eyes are dark colored and the bite is undershot. The tail is either straight or cork-screw. The French Bulldog is an intelligent, lively, playful, and affectionate dog that makes for a delightful companion or family pet. This mild mannered breed loves people, loves to get involved with family play and activities, and loves life. Sweet natured, humorous, and entertaining, the French Bulldog is a very dependable, well balanced, amiable, and sociable breed. These dogs may be small but they have big personalities. The French Bulldog is a sensitive breed, but can also be quite stubborn at times. However, the French Bulldog's gentle disposition, intelligence, and obedience means that he is well suited to novice owners as well as the more experienced. The French Bulldog gets along well with other children as well as with other animals, although he may try and hunt very small animals such as rodents. With strangers most will be friendly and welcoming, although some can be reserved. The French Bulldog can make an effective watchdog as he will be vocal if he senses danger. The French Bulldog requires minimal grooming. A weekly brushing should be done to remove the loose hair, and stimulate the oils in the skin. This will help prevent the skin from becoming dry, flaky and itchy. A once a month bath with a mild soap is all that is needed. Too much bathing can dry out the skin. Nails should be kept trimmed, and the pads of the feet checked often, to ensure that there are no cracking. Frenchies have folds that also need to be kept clean. Gently lift the folds and swab the area with a cotton swab, to be sure that it does not become a breeding ground for bacteria. The ears should be kept clean to avoid infections. The life expectancy of the French Bulldog is around 10-12 years, and there are a number of health problems that are linked to this breed. Their short muzzles mean that they can get worn out quickly and may be prone to respiratory problems if over exerted. 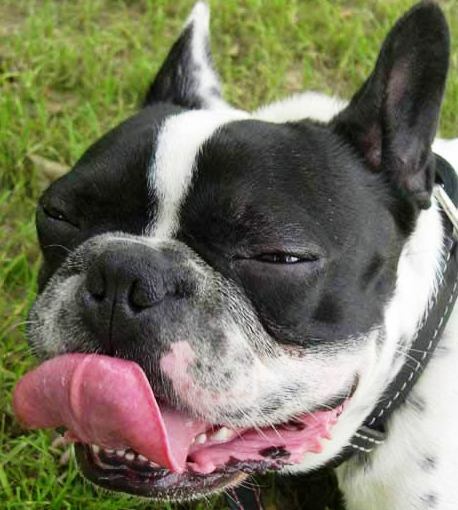 French Bulldogs are prone to eye and respiratory problems. If too overweight, the French Bulldog may have trouble breathing, because of a swollen abdomen. They may wheeze, snore and be gassy. 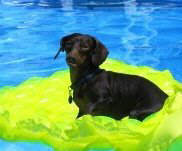 It is said breed can not swim because of his physique, so be very careful around swimming pools. The French bulldog is not the breed to run along side you as you are jogging. They enjoy short walks when the air temperature is moderate. Never expose a Frenchie to higher heat as they are prone to heat stroke. They do well with a short walk and a long nap to follow. The French Bulldog can easily become overheated due to the flat muzzle and breathing problems during extreme temperatures. Proper shade and water should always be provided. Not recommended for outdoor life. Do not exercise this breed in hot weather as this can cause heatstroke. If it's too hot outdoors, move your exercise and play indoors to prevent complications.